From the initial parking of the car – which is a major chore in Waikiki – to the outdoor check-in desk where we were welcomed by friendly staff, fresh juice and comfortable chairs as they programmed our room keys, everything went better than expected.Â Upon entering our rooms, we were greeted by the most magnificent views of the beach. This made a lengthy separation feel like a distant memory as we snacked on fresh fruit and watched the waves from our wrap-around balcony. Military families often have to plan spur-of-the-moment trips and/or extended stays with loved ones who are stationed far away. My boyfriend and I were in good hands as we were able to just focus on us and creating memories during my 18-day visit. While some hotels offer warm cookies and turn-down service, Embassy Suites Hotels and Homewood Suites by Hilton takes it to the next level by providing a full breakfast every morning and a Manager’s Cocktails Reception in the evenings. You are guaranteed these amenities at each property and, in some cases, have access to a full kitchen in your room for those of you who like to cook your own meals. 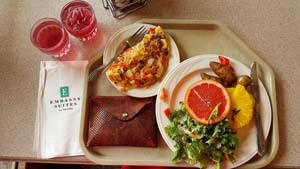 Guests at the Waikiki Embassy Suites location are treated to cook-to-order omelet stations, waffles, French toast, baklava, bagels, breakfast meats, juice selections, and vegetarian and gluten-free options in a rooftop setting with views of the Pacific Ocean and Waikiki Beach. Your travel expenses are cut down by one meal a day as each morning offers something different so you won’t get bored, especially if you are staying beyond a weekend. The Manager’s Reception commences at 5:30 p.m sharp and is complete with a full bar, non-alcoholic beverages, and snacks specific to the region you are in. The beauty of choosing to center your reunion at a Hilton property is that you can find locations in every major city in the United States, including Hawaii, Puerto Rico, Canada, Latin America and the Caribbean. 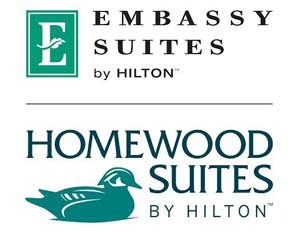 Both the Embassy Suites Hotels and Homewood Suites are all suite hotels that resemble one- and two-bedroom apartments, complete with a living room and couch beds. Rooms come with king size or two queen size beds and can fit six to eight people, depending on room and package. For more information, check out HiltonFamilyReunions.com. Kitty Bradshaw is a Passionate Traveler, Brand Ambassador and Lifestyle Influencer currently splitting residences between New York, Los Angeles, and Hawaii. When she is not busy traveling, stalking airfare glitches, giving commentary on CNN.com, or watching classic films â€“ you can find her on the beaches of Waikiki hanging out with friends. 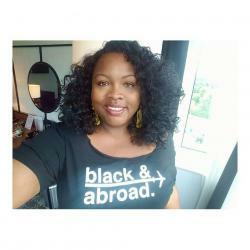 Some of her more memorable trips can be found through the digital pages of Tourist Meets Traveler, Black Enterprise Magazine, and YRB Magazine to name a few.